CodedColor PhotoStudio Pro – An all-in-one photo editing and management solution that allows you to organize your images into albums, view, edit, annotate and much more. The program can handle everything from viewing and printing to publishing them on the web or sharing them by email. 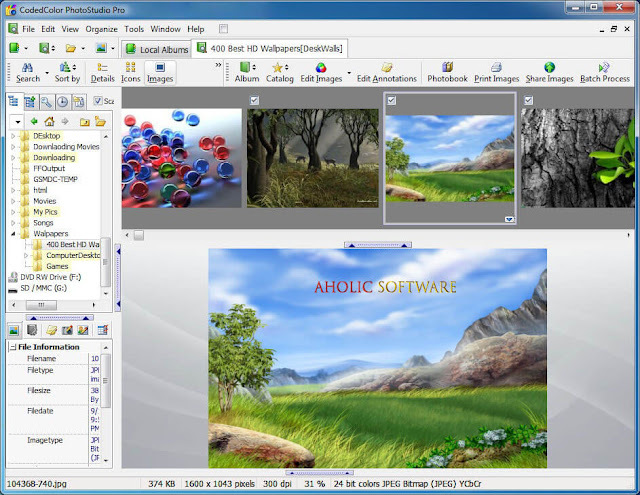 CodedColor PhotoStudio is a Windows photo viewer and editor to organize, edit, resize, reformat, correct, compare, sort, watermark, annotate and print digital images, and to edit EXIF and IPTC data in digital photos. You can rename multiple images, remove scratches, create panorama pictures (stitch), convert RAW photos (from Canon, Nikon, Olympus, etc. cameras), send images via Skype, send photo SMS, burn digital watermarks, correct colors, run a screen show, convert and correct JPEG images in a batch process, rename fields, open pictures and image folders from the Explorer, generate a web-album in HTML and compress JPG images. The CodedColor software interface looks very similar to ACDSee, is easier to use than Photoshop and more versatile than Picasa and Irfanview, but still contains editing and correction features as effective as Paint shop. Have a look at our Before / After tutorials, in order to get an idea of the powerful editor capabilities. The software comes with a detailed handbook and a fast database to store EXIF / IPTC data and color information-en. CodedColor PhotoStudio is a powerful and versatile photo organizer and image editing software for digital camera users. The user friendly interface includes features like photo editing & printing, web album galleries, slide shows, photo management & cataloging, custom sorting, IPTC & EXIF editor, thumbnail generation, resize & resample images, jp2000, batch conversion, database keyword searching, red eye removal, color / sharpness / brightness & contrast correction, artefacts removal, clone brush, scanner & TWAIN import, screen capture, lossless JPEG rotation, gamma correction, print ordering and screen shows with many transition effects, watermark text, image annotations, panorama stitch & animation, video capture, PDF album export, photo layouts, collages, frames, shadows, histograms, automatic white balance, Skype photo sharing, etc. Opens and converts all common image formats: BMP, WMF, GIF, JPEG, JPEG2000, TIFF, PCX, PNG, PSP, PSD, PCD, and all current RAW formats.